Attention, High School Teachers: How Would You Grade These Responses? 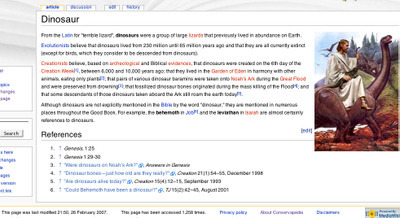 Update for science teachers: The entry on dinosaurs, at the bottom. I'm thinking the image is a spoof. Here is Part I promised follow-on to my Conservapedia post. I've been thinking about this for the last couple of days. There may or may not be a Part II, or Part...more. [This project] began in November 2006, as the class project for a World History class of 58 advanced homeschooled and college-bound students meeting in New Jersey. I don't know what "advanced" means, but surely "college bound students" means those who have applied to college -- in other words, the equivalent of high school seniors. High school teachers, I want to know your opinon on the quality of the responses, below. Prompts are in bold, full length. Answers are in italic, indented. For what grade level is this an appropriate answer (as in, I've give this a B answer for 9th grade World History; it's an ?? answer for 12th grade, and so on). What does the term "economics" mean? Economics is a social science concerned with how society allocates its limited resources. Examples of systems in macroeconomics are capitalism, socialism and communism. What does the term "macroeconomics" mean? Macroeconomics is the analysis of the economy as a whole, or the analysis of large subdivisions of the economy. Macroeconomics is to microeconomics as forest is to trees. Macroeconomics is the opposite of microeconomics. What does the term "microeconomics" mean? Microeconomics is the study of the behavior of individual units, firms, households or persons in the economy. If macroeconomics is the study of the "forest", then microeconomics is the study of the trees. What does the term "capitalism" mean? Capitalism is the economic system which became dominant in the Western world after the end of feudalism. In this system, most of the means of production are privately owned and income is distributed largely through the operation of markets. What does the term "socialism" mean? Socialism is an economic system that requires public ownership and government control over the production of goods. Government is supposed to make decisions about what and how much to produce in an attempt to increase the common welfare. Socialism is common in most parts of the world outside of the United States. Socialism is described by this saying: "From each according to his ability, to each according to his needs." Socialism allows private property in the form of wages to workers, but not in the form of ownership of large companies. Karl Marx considered socialism to be a transitory strage between capitalism (full private property rights) and communism (almost no private property rights). What does the term "communism" mean? All of the responses in indented, italics as above were accessed from Conservapedia on February 26, 2007. The responses were cut and paste copies of what was on the site for the "prompts" or titles given. I am thinking that high school students were assigned to write these responses by their teachers, perhaps as part of the The Eagle Forum University. Give your student a real course in American history, starting January 20, 2007! Sign up now and read the first lecture! This free course covers all the major topics in United States history, from exploration to today. This course makes use of the conservative encyclopedia being built by students, parents and scholars at Conservapedia. Please join this course and begin participating immediately! The teacher is Andy Schlafly, who has personally taught 120 homeschoolers, including his own children. Many of Mr. Schlafly's homeschooled students are now in top colleges.